Big kid stroller - what is it and why would parents need it? Why some of the strollers have capacity of 35 lbs, while others can accommodate a passenger up to 55 lbs? Can 4-year-old child ride in a stroller? Why would parents need a big stroller? Is there a stroller suitable for 5-year-old kid? Many parents often ask these questions and here I will try to answer to them. In this article I will show you what is a “big kid stroller” – what features it has, why it can be useful and when parents need it. Big kid stroller – what is it and what features it has? Let’s start with defining what is a big kid stroller and what function must stroller have to be suitable for bigger and older children. In short, big kid stroller is a stroller that has higher weight limit and longer backrest so it could accommodate kid that is heavier and taller. Therefore such a stroller is suitable for children that are big for their age or suitable for older – even 5 or 6-year-old kids. You may now think that a stroller which can hold such a big child, has to be very large, heavy and bulky. Not necessarily. There are many umbrella strollers for big kids, which are very easy to lift. There are also standard full-sized strollers for older children which are a little bit heavier than umbrella strollers. And of course there are double and jogging strollers for big kids which usually have heavier construction (but not every model – I will show you that later). Before I present you what features such a strollers have, here’s the list of the main types of big kid strollers. Now, let’s see what features can big kid stroller offer to parents. Usually strollers can hold a passenger up to 35 or 40 lbs. Such a capacity is a standard. However, manufacturers know that parents may need buggy that can accommodate even bigger child, that ‘s why they design single strollers with a weight limit of 55, 65 or even 75 lbs and double strollers with a capacity of 100 or even 110 lbs! Such a stroller should also have more roomy seat with longer back rest and higher canopy so it could accommodate taller child. There are strollers that even 5-year-old children can fit into it without touching the canopy with their heads. Some models of big kid strollers feature also recline seat. Some parents may think that an older child doesn’t need such a features because he doesn’t take naps during strolling. In my opinion, recline seat can be still very useful even for older and bigger kids and it’s also crucial for big child’s comfort. It should be wide and high to give a child more room to grow. Besides, it should be also large and expandable to provide a lot of shade – enough to cover bigger child. If the stroller is supposed to hold up to 50 or 100 lbs, the frame has to be very strong and robust and made of high-quality materials. Big kid strollers have also other features that other types have. For example, there are models with adjustable handlebar, quick and compact fold and large storage space for parents convenience. There are few models that are very easy to store or even to carry around on a shoulder. Strollers for older children have different types of wheels: some of them have air-filled tires, while other have rubberized or plastic wheels. Few models have suspension to make the ride more cushioned. This type of strollers also offer many accessories, some of them are included, some need to be bought separately. And of course big kid stroller vary in price – we can find them in really wide price range, from $150 to $700. When and why would parents need a big kid stroller? However, other people should not judge why a preschooler is riding in a stroller because in fact there could be many important reasons for that. Sometimes parents use strollers for bigger and older kids not only because it is “convenient” and “more comfortable” for them, but because they need to. Maybe their kid got really tired after a long walk? Maybe he/she is not used to long distances and is not able to go all the way on foot. Maybe parents needed to go somewhere really quickly, maybe the kid has fallen asleep in the car but is too heavy for parents to carry in arm? Maybe the child only looks like a 4-year-old but in fact he’s a really big 2.5-year-old? There can be many other reasons, so we shouldn’t judge parents who use a stroller for their older child. When big kid stroller is useful for parents? Here I would like to discuss why parents may need stroller for their older child and when it can be useful. Every child develops at different pace. Some 2-year-old children are 32 inches tall, while others are 36”. At the age of 4 some kids can weigh 32 lbs, while other can weighs 40 lbs or even more! The differences between children can be really big and that’s why some parents may need larger stroller with higher weight limit or longer seat back, because they child grows faster than his peers. Even when 3-year-old child can walk really well is very independent, longer distances may be really tiring for him. For example, the nursery school can be far away from your home and your child just gets tired after a while and is not able to go on foot the whole distance. In this cases it is good to have a stroller at hand, and in this situation umbrella and lightweight strollers are the best. These two types of strollers are really light and portable. It’s nice to have a stroller that can be quickly opened and folded up and carried on a shoulder or in a bag when it’s not in use. This types can be also useful during long strolls with a toddler who like to walk, but sometimes gets tired and wants to sit in a stroller for a while. Then when he gets rested, he can walk again and you can just throw this lightweight buggy on your shoulder. Maybe you love sightseeing and you visit a lot of places on a vacations, but it’s too exhausting for your baby little feet? Stroller can be really useful if you travel with 3, 4 or even 5-year-old child. Besides, it can be also a life saver at the airport, when you need to move really quickly or wait in long queue for very long time. Large stroller with bigger capacity can be really useful for children who just had a surgery and their mobility is temporary limited. Big stroller with roomy and comfortable seat can be also very helpful for parents of children with special needs. Such a stroller gives parents more flexibility. Going to the doctor, spending time outside the house, running errands – it can be much more easier with a stroller that can accommodate bigger and older children and provide them with comfortable and safe ride. Such a stroller is not only comfy for the kid, but also more portable and convenient for parents. Is there a stroller for 5-year-old child? Many big kid strollers can accommodate children from 3 to 7 years. For example, GB Pockit is an umbrella stroller that can easily fit a 5-year-old child and Joovy Zoom 360 Ultralight is a jogging stroller that parents use even for 6 or 7 year-old kids! My full list of strollers suitable for big and older children you can find in this article. I have 2 children that are severely disabled. They are 6 & 4, but about the size of a 4 & 3 year old. It’s hard to take them anywhere on my own because they both have their own wheelchair. We used the Baby Jogger City Select double stroller until last year when my daughter grew a little too tall for the back of the seat. We absolutely LOVED it. The leg room isn’t too much of an issue, but it can’t be a complete drop-off, there needs to be some leg support. What double strollers could I look into that have a taller back than the City Select? Most standard strollers have similar dimensions, usually the seat back is 18″ tall and there are about 24″ from the bottom of the seat to the top of the canopy. Among double strollers Baby Trend Navigator is pretty bit and can accommodate tall kids (up to 42-43″). How tall are your children? How big is your child? :) Also, what type of a stroller you need and what is your budget? I invite you to check my ranking of the best strollers for big kids here. You can find there different types of strollers (lightweight, umbrella, standard, jogging strollers…). Which model is best for children over 40 in? I was looking at the Zoe you suggested, but want whichever is best for the tallest of children. Many Thanks! Have you read my ranking (here)? Here are also dimensions of the best lightweight strollers for bigger kids, consider not only the backrest size, but also the max. capacity. I hope it will help you to make your decision. GB Pockit – Weight: 9.5 lbs, capacity: 55 lbs. Seat: 12″ wide and about 24″-25″ long. If you look at GB Pockit you will notice that its backrest goes from the bottom of the seat to the top of the canopy, there is no gap between the backrest edge and canopy (the top of the backrest is like a headrest). 24″-25″ it’s a length of a whole backrest. ZOE XL1 – Weight: 11 lbs, capacity: 50 lbs. Seat: 12.5″ wide, while the backrest is 18″ long, and there are 8 inches above it to the top of the canopy. For a tall child there is no headrest and their head is above the backrest, but since the canopy is really tall there is a lot of head room. UPPAbaby G-LUXE – Weight: 16.3 lbs, capacity: 55 lbs. Seat: 13″ wide, backrest is 20″ long + 6/7 inches to the top of the canopy. However, this stroller folds like an umbrella (narrow, but long), while the three previous strollers fold into a compact box. Hello!! Thanks for writing all that. I’m a mama of 3, and I have a very special needs 6 year old who is 40 lbs bit cannot walk. I was looking for something that would we could use ( especially at Disney and we have an annual pass this year) that could seat her and my 3 year old as well…any suggestions?? Thank you!! Hi Jen! If your children are already 3 and 6, I think a standard double stroller may not be a good choice. Most double strollers have capacity of 50 lbs per seat so it wouldn’t serve you long. Have you considered stroller wagon like Keenz 7S? It’s roomy enough to accommodate 3 and 6 year old, it’s cheaper than many double strollers and if you push it like a stroller you can take it to Disney (on Instagram you can find many photos of Keenz wagon in Disneyland). If you’d still prefer a double stroller Baby Jogger City Mini GT double is worth trying. I am looking for a lightweight stroller for my special needs grandson. He is 3 but tall for his age and will need a stroller for awhile! Hi Linda! 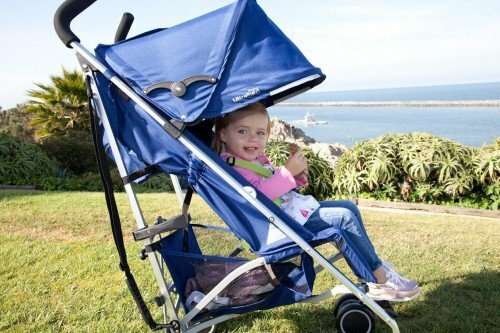 Here’s my list of the best strollers for bigger and taller children: https://www.littlebabygear.com/best-strollers-big-kids/ There are 4 lightweight strollers, including GB Pockit and GB Pockit Plus which some parents use even for 5 and 6 year old kiddos. These strollers are pretty basic, but very light and compact, ideal for short walks, running errands or travel. We have 2 kids, 3.5 year and 3 month old both of whom are big kids. My daughter is over 40lbs and my son is shy of 20lbs. I need a double stroller for them and was wondering if you had a list on your web page that lists double strollers for large kids and if they also list the max weight allowed. Generally, my understanding is that a double BOB has a max of 100lbs, any chance they have 110lbs max capacity stroller? Or if you could provide the names of stroller companies that have a max capacity of 100 and 110lbs, that would be better. Hi Tony, sorry for late reply! I went through all the modern stroller brands and basically found only two strollers with capacity of 110 lbs: Maclaren Twin Triumph and UPPAbaby G-Link. These are umbrella strollers with very small wheels, suitable only for city use and flat, smooth surfaces. All BOB double strollers, as well as double joggers from Thule and Baby Trend, have max capacity of 100 lbs. It’s the same with strollers like Baby Jogger City Mini GT Double and Baby Jogger Summit X3 Double. 1. Baby Jogger City Select LUX + bench seat. The main seat can accommodate a child up to 45 lbs, the bench seat up to 65 lbs. Notice than the bench seat is only compatible with LUX version, not the old City Select.